I spent my winter break in Bogota, Colombia; visiting the country for the first time and discovering the rich tradition of craft and fine art. The two museums I was able to visit were the Museum of Gold and the Botero Museum. The Gold Museum displays pre-hispanic gold artifacts, and is the largest collection in the world with over 55,000 pieces, 6000 of which are on display at any given time. The museum illuminates the sacred metal and its symbols and uses among the native peoples living in Colombia. It was shocking for me to learn that over 60 native cultures still exist today in Colombia, speaking over 80 languages and dialects. In the gift store, I purchased 24K gold earrings that are abstracted shape of bats, a replica of the original artifact of the Zenú people (100 B.C -1600 A.C). My boyfriend Juan bought me a gold ring with a spiral design, an artifact of the Tairona people (200 A.C - 1600 A.C). Just a few blocks away from the Gold Museum is the Botero Museum. In 2000, Botero donated over 200 art pieces, many of his own and some of his collection of international artists, to the Bank of the Republic. 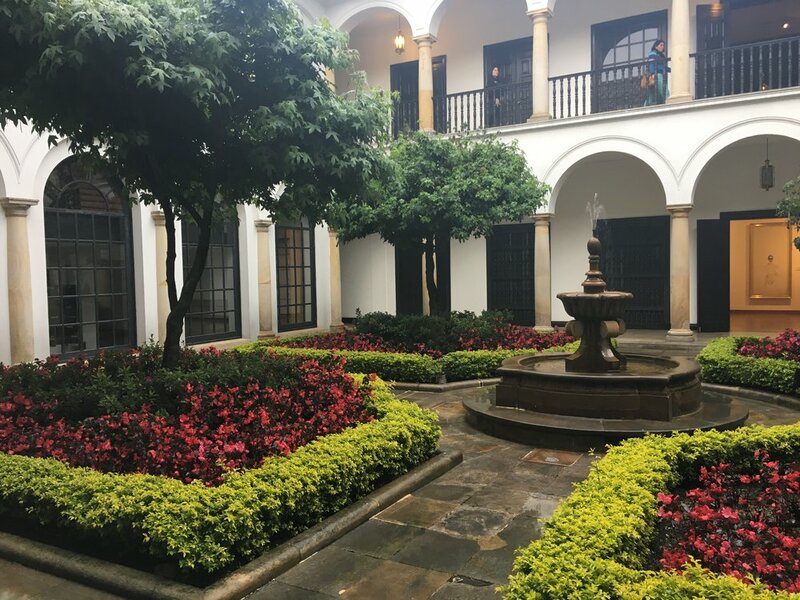 With this collection the Bank created the Botero Museum, and acquired a colonial mansion in the city center’s historic Candelaria neighborhood to display the work free to the public. Though I understand why many do not care for Botero's stylized voluminous people, while touring the museum with an audioguide I quickly learned that his intention to render large sumptuous forms was to exalt the subject matter. Botero adored renaissance painters, and took the European still life tradition and applied the concept to a Latin American context with local fruit in his own style. It was with still life painting that he practiced the sensuality of form and volume. One still life painting of a watermelon partially sliced conjures up religious allusions such as the wound of Christ. He also loved the impressionist and post impressionist painters and depicted a few of his favorites, Courbet and Cezanne, in his own style to note his awareness of art history. Because most of Botero's large scale paintings are highly colorful, I was charmed by his self imposed periods of "grey diet" where he would only use black, white and grey to take a break from color, only to fully appreciate its importance in image making. His work naturally lends itself to 3D renderings, and his sculpture work is as exciting if not more compelling than his large scale sumptuous paintings. Botero now spends his summers in Pietra Santa, Italy, sculpting because of the white grant quarries there. It was interesting to find that art galleries and independent art spaces were somewhat uncommon in Colombia's capital and largest city, Bogota. Where I stayed in the Chapinero neighborhood, one of the more affluent communities, the few art galleries I found were in luxury shopping malls selling artwork at extremely high prices ($15,000 - $30,000 American Dollars). Though Bogota's gallery scene may be emerging, the city hosts a progressive annual art fair in October entitled ARTBO | International Art Fair of Bogotá. Established in 2004, ARTBO is a program of Bogotá Chamber of Commerce created to encourage cultural exchange and research and to promote Colombia’s art scene. I hope to return to Bogota in October 2018 for this!